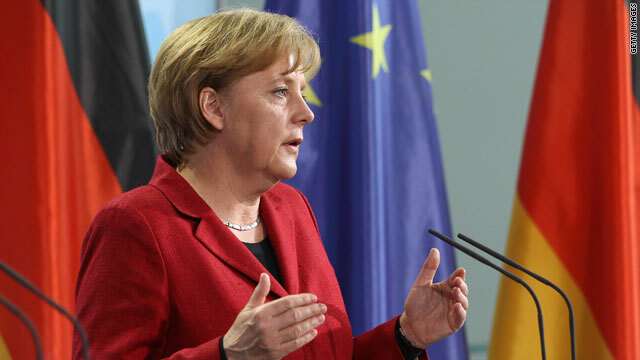 German Chancellor Angela Merkel has been at the forefront of discussions about a rescue deal for the eurozone. London, England (CNN) -- Financial markets across the world surged while the euro strengthened against the dollar Monday, a day after Europe's finance ministers approved a huge rescue package aimed at stabilizing the eurozone. The Dow Jones industrial average gained 405 points, or 3.9%, the average's biggest one-day point and percentage gain since March 23, 2009. In late afternoon trading in Europe, the Paris CAC 40 was up by almost 9 percent, while London's FTSE 100 and the Frankfurt DAX were just short of 5 percent. In Asia, Tokyo's Nikkei index closed up 1.6 percent, while Hong Kong's Hang Seng advanced to 2.54 percent by the close of play. The euro soared above $1.30 from $1.2755 on Friday. This follows a week of heavy stock market losses for some of the EU's member states in the wake of a massive bailout for Greece's battered economy. Video: Who to blame for EU woes? The "stabilization mechanism," unveiled after an emergency meeting in Brussels, Belgium late Sunday, will give the 16 members of the eurozone access to loan guarantees worth at least €440 billion ($560 billion) in an effort to prevent the fallout from Greece's debt crisis spreading. The International Monetary Fund will also provide up to €220 billion ($280 billion) to the "crisis fund," Spain's Finance Minister Elena Salgado said Sunday. Another €60 billion ($76 billion) would be available should member states experience "exceptional occurrences" beyond their control, Salgado said. 1. U.S. government's Emergency Economic Stabilization Act in October 2008 provided $700 billion rescue plan designed to eliminate the "toxic debts" that pitched Wall Street and global markets into chaos after collapse of U.S. investment bank Lehman Brothers. 2. U.S. Savings and Loan (S&L) crisis in the 1980s cost the U.S. government $150 billion, after hundreds of small banks which specialized in home loans were all but ruined after financial deregulation had allowed them to engage in increasingly speculative transactions to raise capital. 3. In October 2008, British PM Gordon Brown announced a $500 billion rescue plan for the UK banking sector which had been caught up in global financial crisis of 2008. 4. A month earlier, Fannie Mae and Freddie Mac, the two biggest mortgage companies in the U.S., were given $200 billion and effectively nationalized following the subprime mortgage crisis - which many analysts view as the catalyst for the global crisis which followed. 5. U.S. Treasury was also forced to step in to help insurance giant AIG with its funding crisis in September 2008, fearing a domino effect after the collapse of Lehman Brothers. It cost the taxpayer $85 billion. The European Central Bank also announced on its Web site it would begin acquiring eurozone government and private debt "to ensure depth and liquidity in those market segments which are dysfunctional." German Chancellor Angela Merkel, at the forefront of negotiations over the plan, told reporters Monday that the package "serves to strengthen and protect the common currency." Greek Prime Minister George Papandreou told CNN the volatility in the markets did not give his country time to implement the kind of reforms its ailing economy required. "But Europe stepped in order to regulate the markets in a way which would allow us to make these changes," he said. Olli Rehn, the European commissioner for economic and monetary policy, also praised the deal, saying "the fiscal efforts of European Union member states, the financial assistance by the (European Commission) and member states, and the actions taken today by the (European Central Bank) proves that we shall defend the euro whatever it takes." "This is Shock and Awe, Part II and in 3-D," Marco Annunziata, chief economist at Italian bank UniCredit Group, told Britain's Telegraph newspaper. "This is truly overwhelming force, and should be more than sufficient to stabilize markets in the near term, prevent panic and contain the risk of contagion." In Washington, U.S. President Barack Obama on Friday said he spoke with Merkel regarding economic and financial developments in Europe. "We agreed on the importance of a strong policy response by the affected countries and a strong financial response from the international community," he said. "I made clear that the United States supports these efforts and will continue to cooperate with European authorities and the [International Monetary Fund] during this critical period." European Central Bank officials have tried to play down fears that the economic turmoil in Greece could spread to other heavily indebted European countries such as Spain, Portugal and Italy. Spain saw three straight days of losses in its stock market last week after the country's credit rating was downgraded by the influential rating agency Standard & Poor's. Are ratings agencies credit worthy? However, first quarter figures showed Spain became the last major world economy to lift itself out of recession, its central bank said Friday. "Gross domestic product grew by 0.1 percent on a quarterly basis following six consecutive quarters of contraction," the bank said in a statement, stressing that this was only an initial estimation. Are the ratings agencies worthy of credit?